provided that it does not stray too far from its equilibrium point; in other words, provided does not become too large. The pattern of motion described by this expression, which is called simple harmonic motion, is periodic in time, with repetition period , and oscillates between . Here, is called the amplitude of the motion. The parameter , known as the phase angle, simply shifts the pattern of motion backward and forward in time. Figure 2.6 shows some examples of simple harmonic motion. Here, , , and correspond to the solid, short-dashed, and long-dashed curves, respectively. Note that the frequency, --and, hence, the period, --of simple harmonic motion is determined by the parameters appearing in the simple harmonic equation, Equation (2.61). However, the amplitude, , and the phase angle, , are the two integration constants of this second-order ordinary differential equation, and are thus determined by the initial conditions; that is, the particle's initial displacement and velocity. Figure 2.6: Simple harmonic motion. where use has been made of Equation (2.62), and the trigonometric identity . 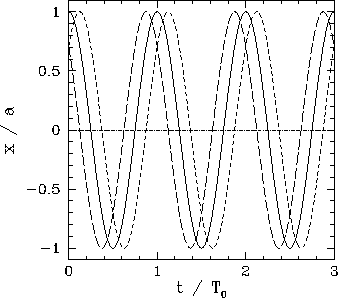 Note that the total energy is constant in time, as is to be expected for a conservative system, and is proportional to the amplitude squared of the motion. where and are arbitrary constants. Thus, unless the initial conditions are such that is exactly zero, the particle's displacement from the unstable equilibrium point grows exponentially in time.